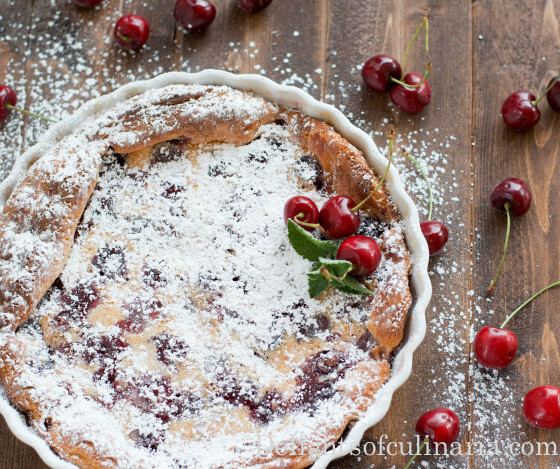 Cherry Clafouti is a french country-style egg custard dessert slightly similar to quiche.Sweet cherries are covered in pancake-like batter then baked until puffed and nicely browned.It”s a really quick and easy custard type dessert that has no need to be cooled or stored in a fridge before serving.Clafouti also can be versatile by replacing cherries with any berries,plums, or peaches.It can also be served for breakfast or brunch. Heat oven to 325F degrees. Butter a 10 inch round pan (do not use a springform pan or removable tartlet pan). Arrange cherries evenly on the bottom of a pan. Add sugar,vanilla,kirsch(optional),salt and flour.Continue whisking until all lumps are removed. Pour the custard over cherries and bake for 1hour – 1 hour and 15 minutes.The custard should be lightly browned and firm to touch when done. Dust with powdered sugar while still warm or cooled.